The Augsburg College Department of Physician Assistant (PA) Studies was recently awarded the 2007 American Academy of Physician Assistants' Constituent Organization Award of Achievement for a high school curriculum project developed in 2005. With the help of the Minnesota Academy of Physician Assistants (MAPA) to help fund the project, Augsburg's PA faculty developed a program that would: educate high school students about the role of a PA; target diverse students; increase the diversity in the Augsburg PA application pool and student population; increase the diversity among PA providers; and provide health education and hands-on learning opportunities. The money received from MAPA was used to purchase re-usable supplies for the educational presentations. 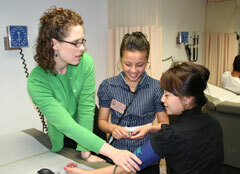 In May of 2006, the first group of high school students came to the Augsburg campus to learn more about the PA profession and medicine in general. The pilot year was such a great success, that on May 16 and 17 of this year, the PA program hosted four more groups of high school students, including students from Rosemount High School, the Augsburg Fairview Academy for Health Careers, and Harding High School. The high school students participated in interactive educational activities on how diseases, specifically HIV and other sexually transmitted infections, can spread, as well as how to administer a neurological exam and take blood pressures. Current PA students and some recent graduates helped with this year's teaching. The PA department plans to continue hosting student groups each year and build a larger repertoire of educational activities from which participants can choose. Another goal is for this program to become "portable" and take it on the road to wherever the interest lies. As the only physician assistant program in Minnesota, Augsburg's Department of Physician Assistant Studies educates generalist physician assistants oriented toward service to underserved populations, both in rural and urban settings. A physician assistant is a dependent practitioner of medicine who practices under the supervision of a licensed physician in a multitude of settings and specialties of medicine. Common job responsibilities include taking patient histories, performing physical exams, ordering and interpreting laboratory tests and radiological studies, formulating diagnoses, and administering treatment. Photo: Brenda Talarico, assistant professor, shows students from Harding High School how to take blood pressures.